You should signal in good time on approach. Not too early as other road users could interpret your signal as not being for the roundabout, and not too late as this could give other road users insufficient time to deal with your intentions. Approaching to take the first exit on the left - signal left on approach in good time. Approaching to take an exit on the right - signal right on approach in good time. Approaching to take the road ahead - do not signal on approach. If you realize you need to change lane on approach, then signal before changing lane and as soon as you have completed changing lane cancel your signal (before reaching the roundabout). To leave a roundabout you should signal left as soon as you pass the exit before yours. So when checking the sign on approach to a roundabout it helps to not only take note of your exit but also to take note of the exit before yours. Now, as you travel round the roundabout and see the exit before yours you know that you can signal after that exit even if you can't see your exit at that point. What's a blocker? - A blocker is a vehicle that when it enters the roundabout it stops the traffic that you have to wait for. If you time this correctly then you can go while the other traffic is blocked. The following is the Glencor Driving School instructor's interpretation of various roundabouts. Due to these being interpretations, they should not in any way be considered as legally binding. During my time with Glencor I gained invaluable experience that assisted me throughout my driving tuition. Not only did this help me to pass first time it also gave me the confidence to drive on the road by myself. i.e. don't signal on approach. 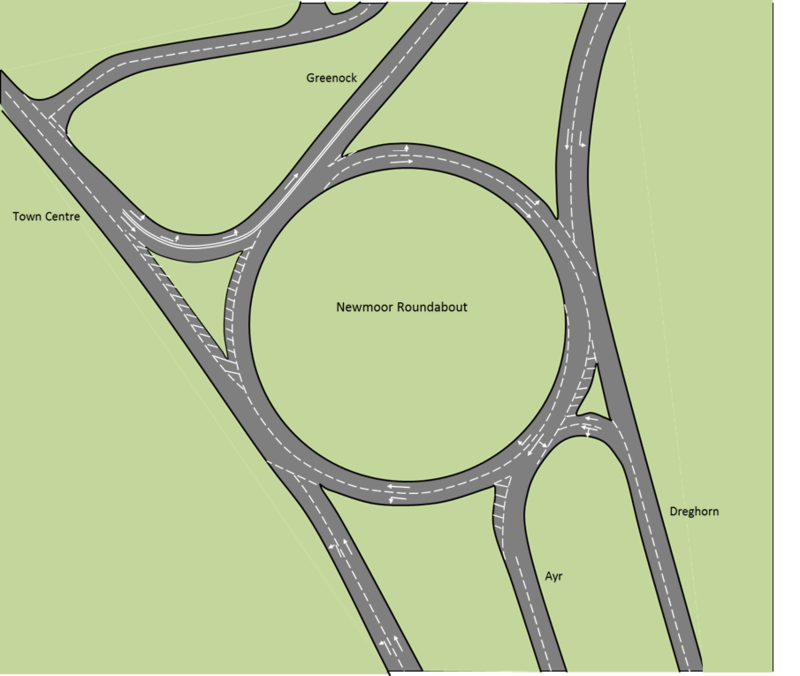 For the Newmoor Roundabout, if you are not taking the first exit then approach in the right-hand lane. The exception to this is when you approach from Dreghorn, then you should use the left-hand lane for Ayr or Town Centre. I would highly recommend learning to drive with Dave. He taught me to drive in a calm and controlled manner while helping me with the aspects of driving that I struggled with. When travelling from Riverside to Town Centre follow the route as indicated by the blue(1) line. When travelling from Riverside to Kilmarnock follow the route as indicated by the red(2) line. 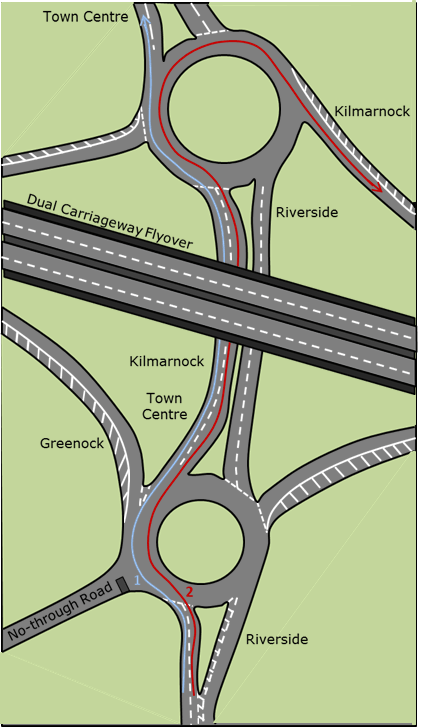 The right-hand lane is used at the first roundabout because Kilmarnock is to the right at the second roundabout. I had a terrible start to driving with two previous instructors before contacting Dave. I was completely out of confidence but this soon changed. Dave brought out the very best in me with his great assets of keeping me extremely calm and comfortable and his great ability in teaching learners. I'm glad I found Dave and I really can't praise and thank the man enough. AN OVERALL FANTASTIC INSTRUCTOR TO GO WITH. Note: - On this roundabout, when taking the road ahead from Mauchline to Kilmarnock (London Road), and vice versa, steering your car into position is important and you should follow your route as indicated by the blue(1) line or the red(2) line. As a guide, try to follow towards the island that separates the lanes of the junction before yours and then steer towards your exit while not allowing your car to cross over the 'faint tarmac join line'. If you cross over this 'faint tarmac join line' then you will be entering the right-hand area on the roundabout, but this area is for traffic turning right at the roundabout. Waiting is not hesitation if there has not been a safe opportunity to continue. Hesitation is not continuing when there has been a safe opportunity to do so. Friendly instruction, very laid back. Explains any faults thoroughly. Spent the majority of lessons on the road driving. Pushes you forward, as I was on the test routes by the 3rd lesson. Overall, very good. Note: - On this roundabout the left-hand lane (on the roundabout) is wide enough for two vehicles when travelling from Town Centre to Ayr, and vice versa, therefore position is important when following these routes. Travelling from Town Centre to Ayr. Approach the roundabout in the left-hand lane and when you travel onto the roundabout keep your car more to the right of the wide left-hand lane following the route as indicated by the blue car(2). There is a faint tarmac join line and this can be used as a guide to keep your car in position. Do not move too far right as this could impede traffic using the right-hand lane (travelling for Irvine). If travelling this route, indicated by the blue car(2), then be aware of any vehicle that might be travelling through using the far left side of the wide left-hand lane, and continues through for the Ayr exit. Travelling from Ayr to Town Centre. Follow this route, indicated by the green car(3), and use the same principles as for 'Travelling from Town Centre to Ayr'. Travelling from Town Centre to Bellfield. Approach the roundabout in the left-hand lane and when you travel onto the roundabout keep your car more to the left of the wide left-hand lane following the route as indicated by the red car(1). Being in this position means that if the car behind you is travelling to Ayr, as indicated by the blue car(2), then they can position more to the right and pass you on their way to the Ayr exit. I have met them, several times! Ever since I can remember I have always wanted to drive. When my seventeenth birthday came and I started my lessons with Glencor there was no one else I would have rather been with because right from day one, David made me feel comfortable and relaxed on the roads. Although he pushed me and put me through my paces he never made me do anything I didn't want to do. And anything that was necessary for my test, that I was struggling with, he would focus on helping me with and using different methods of teaching, he was always able to bring me up to standards. Note: - On this roundabout, when taking the road ahead from Glasgow (Hurlford) to Town Centre, and vice versa, either lane can be used (the left-hand or the right-hand lane). Travelling from Glasgow (Hurlford) to Town Centre. If you use the right-hand lane then you must exit the roundabout still in the right-hand lane as indicated by the red line(2). This is because traffic in the left-hand lane can also travel through as indicated by the blue line(1). You would use the right-hand lane if you knew that at the junction after this roundabout, you were going to turn right. Travelling from Town Centre to Glasgow (Hurlford). Just like 'Travelling from Glasgow (Hurlford) to Town Centre', if you use the right-hand lane then you must exit the roundabout still in the right-hand lane. There is one difference for this route and that is, very shortly after you exit the roundabout you will have to merge into the traffic in the left-hand lane because the two lanes are reduced to just one lane. Therefore, if the left-hand lane is flowing freely i.e. there are no obstructions or very slow vehicles, then it is best to use the left-hand lane on this route. Thoroughly enjoyed learning to drive with David. He was friendly, patient and supportive from the first lesson to the last. He made learning to drive fun and I would recommend him to anyone who is looking for an excellent driving instructor. Thanks David! Due to changes on this roundabout it has been temporarily removed from this website. If it's a pass you're for, then Call on Glencor. Had a great driving experience with Dave as I never felt under pressure. Was able to feel relaxed for every lesson. Even though I had quite a lot of lessons I feel that if I had been with an instructor who was less patient with me I probably would not have passed. Highly recommend Dave as an instructor as you would not only get a fantastic instructor but a great car to learn in. David is a great driving instructor. He has a patient nature which helped me overcome my nerves. I passed within three months and recommended David to three friends, one of which had been learning for over a year. With David as his new instructor he passed after a minimal number of lessons. David was an excellent instructor. He was patient, did not waste your time/money on unnecessary lessons and believes the best way for you to learn is to get out there. N.B. My uncle is a driving instructor: my younger brother will be taking lessons from David!